Meet Darryl Porter, a proud father and grandfather who enjoys cooking for friends and family. He’s a boy scout cycling master and an ordained deacon. A soft-spoken and polite family man, Porter is an avid fisherman who enjoys the outdoors. seeing him on the job. His badge reads City of Chicago Department of Revenue, and his job title is booter. older than one year. That adds up to more than 530,000 vehicle owners responsible for paying millions of dollars to the City of Chicago. Unfortunately for the workers who install and remove this debilitating contraption, booters don’t work on commission. The money that is paid to have the boot removed goes straight to the city’s Department of Finance, which merged with the Department of Revenue in 2012, but most trucks and uniforms don’t reflect the merger. booters were equipped with a telephone book-sized listing of expired plates. Today, being a booter in Chicago means being a laborer, data entry tech and a driver. Porter said each week, booters are assigned a specific zone to patrol across the city. The zones are broken down with 15 zones for the north, 15 zones for the south and each zone varies in size. For example, one zone stretches from King Drive to Halsted Avenue and from 22nd to 59th. After receiving their zones for the week, booters start up the vehicle’s computer system – an IBM database with hundreds of thousands of license plate entries. Despite common belief, booters don’t have access to the vehicle owner’s information. They don’t even have the address where each plate is registered to, and they don’t have the unpaid ticket information for each license plate. The only information Porter has in front of him is the license plate numbers for all vehicles in Chicago that his computer system says need a boot. is on, if the vehicle is parked and accessible, or if it’s in moving traffic or parked in an area where Porter can not access like a private parking lot or garage. he has to act swiftly installing the boots. Booters cover routes all over the city from high crime to high-end areas, from King Drive to Oak Street. There is only one person per van, and booters rely on the van’s cameras to provide surveillance. However, if the vehicle being booted is parked on the right side of the van, only the right camera will record surveillance. Porter said there’s always an element of the unknown when he boots a vehicle. He recalls some situations where multiple people surround the parked car upon seeing his van approach in order to create a distraction while the vehicle owner attempts to flee. In other situations, booters are cursed at, spit at, screamed at and even chased down the street either by another car or by individuals. Even those booters who are responsible for removing the boots often encounter disgruntled owners. This is where Porter’s training as an ordained deacon and a generally patient person come into play. “When you’re a person who genuinely wants to help other people, this job takes you totally out of your norm,” said Porter. Porter was ordained as deacon of Gospel Way Covenant Church, 8152 S. Saginaw, in 2005 after being involved in the church for much of his life. His father was a deacon and a maintenance worker. Porter is a lifelong Chicagoan who has raised three kids in the city with his wife. His youngest son shares Porter’s calling to help others. A freshman at the College of DuPage, Porter’s son achieved the highest rank as Eagle Scout and he is testing for the Chicago Fire Department. Porter said his son recently led a drive to collect donated clothes and winter wear for VietNow, an organization made up of U.S. Armed Forces Veterans from 1957 to present day who are committed to helping homeless veterans. When he’s not working, Porter said he enjoys camping and fishing and spending time with his family, especially his two granddaughters. The City of Chicago employs 38 booters who together bring in an estimated $30 million for the city in revenue each year. However, a Dec. 5 Chicago Sun-Times story announced the city is considering a pilot program that would introduce self-release boots to Chicagoans. This idea first surfaced in 2006, but city lawmakers rejected the idea vehicle owners being responsible for returning the boots. While it remains uncertain if Chicago will move in the direction of self-removal boots, New York and Seattle have implemented the do-it-yourself boot removal procedure. 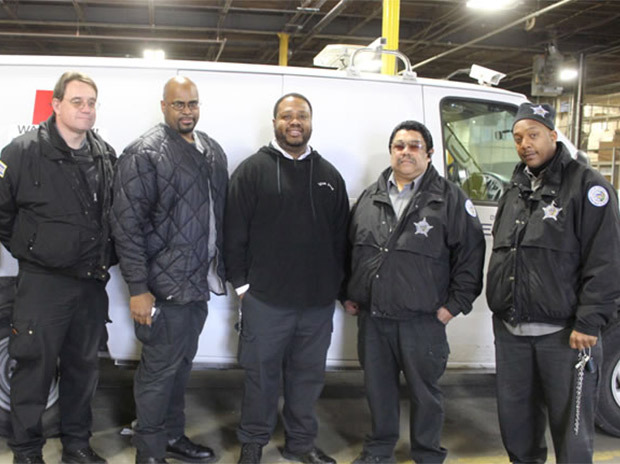 Teamsters Local 700 represents approximately 2,000 members with the City of Chicago, including the 38 men and women who install and remove vehicle boots for the City’s Dept. of Finance.